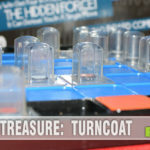 Now that you’ve gotten your fill of sweets in yesterday’s Halloween feature, Ghosts Love Candy, we turn to what is the first of a series of games. 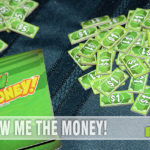 Level 99 Games has created a new card game that reminds us a bit of Fluxx, where you can combine completely different themed copies of the same game to create a wild new version. 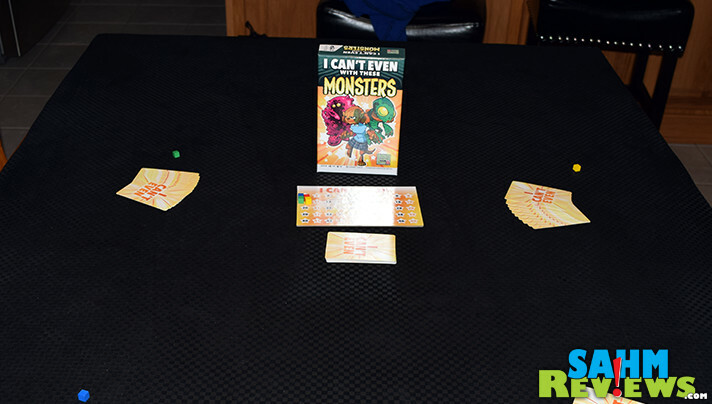 I Can’t Even with These Monsters, probably one of the best-named titles we’ve seen to date, is a card game about collecting monsters to your ‘bank’, scoring when you do so. 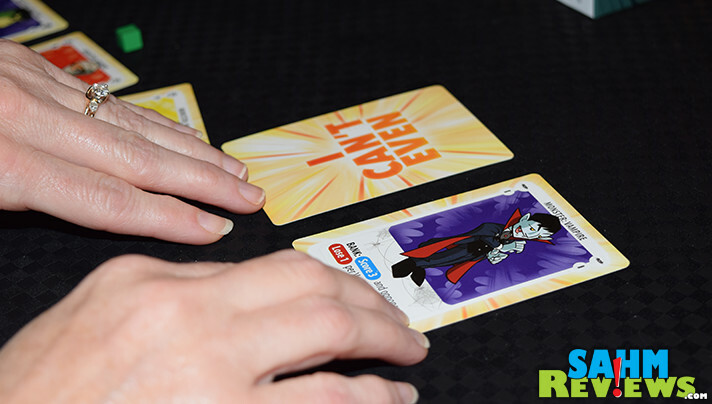 Supporting up to six players, each person is dealt a hand of 9 cards (8 if playing with a full compliment of six) from the shuffled deck of 56 Monster Cards. 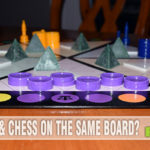 Everyone also begins the game with 10 points, which is kept track of on the included score board using colored cubes. 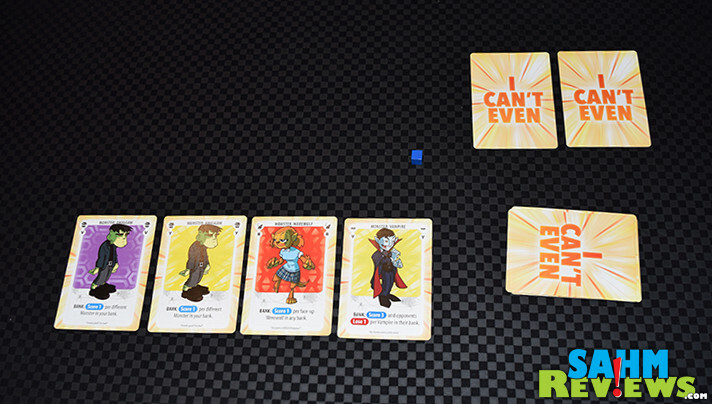 A full game of I Can’t Even with These Monsters is played over seven rounds, and each round is divided into three phases. 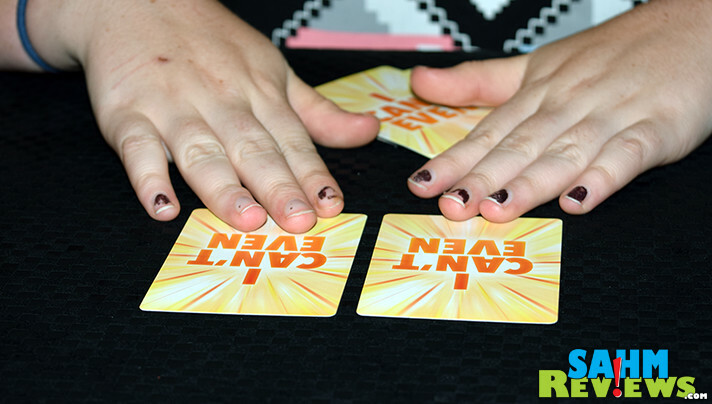 First, everyone chooses two cards from their hand and lays them face-down in front of them. This is called “The Pit” and is the area you’re sacrificing your monsters to. Everyone then turns one of their cards face-up for all players to see. 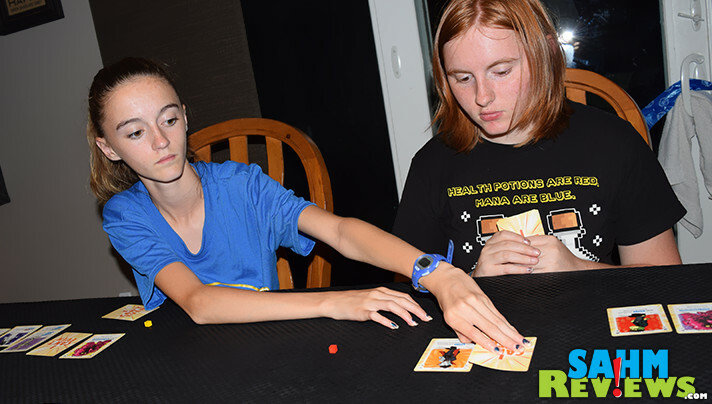 Beginning with the player with the fewest points and continuing in clockwise order, everyone chooses one card from an opponent’s pit. This can be one of the face-up or face-down cards and that monster is placed into your hand. If selecting a face-down monster, keep it hidden so that no other players may see your selection. After all players have chosen a card, there will be some left in individual pit areas. These monsters are moved into their respective player’s bank. Each card has a scoring action on it that occurs when banked. Compute the total gained (or lost) and adjust your score on the board accordingly. On some rounds you may not receive any cards to your bank if both were chosen by other players. Other rounds you might receive two cards! After seven full rounds the game ends immediately. 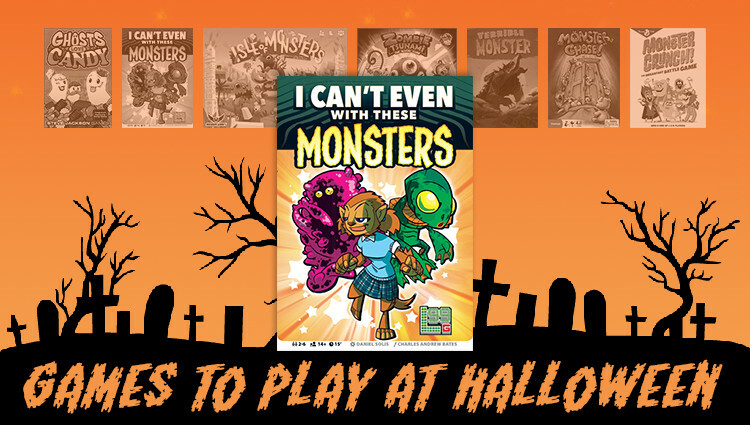 But I Can’t Even with These Monsters isn’t simply a game about highest scores! 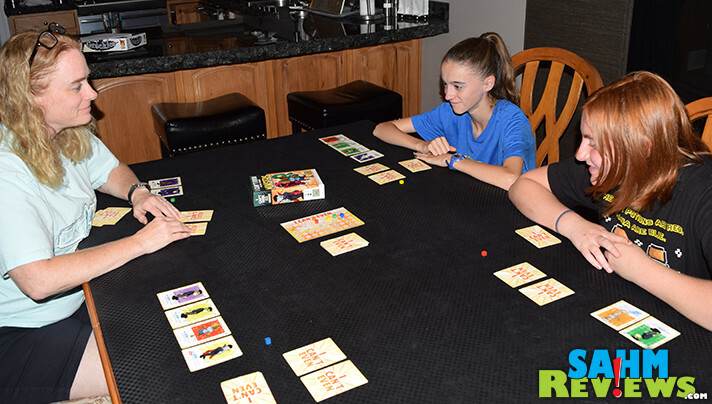 These monsters turn the tables and only the person with the highest odd-numbered score wins the game. (Get it? “I Can’t Even”!) If all players have even numbers, then the highest total wins! 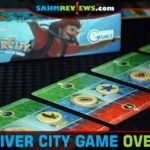 Quite a unique card game and one that will be interesting to play if we ever get our hands on copies of the other two currently in the series. Combining them should lead to interesting scoring, especially since the game will still only last seven rounds. If they are all as inexpensive as I Can’t Even with These Monsters is on Amazon, there’s no reason not to own the full collection! 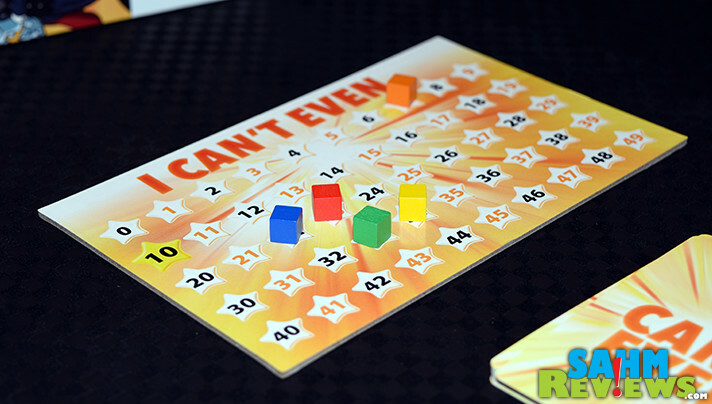 Want to find out more about the I Can’t Even with These series? Read up about it over on Level 99 Games’ website and be sure to follow them on Facebook and Twitter to learn more about their current line and a new Kickstarter campaign on the horizon! Do you enjoy games you can combine with others to make a new game? What a cool game and very timely for the season. Thanks for posting! That is a unique card game to do this coming Halloween. It looks like a lot of fun and I am sure my kids would love it. not the biggest fan of fluxx, but would play if it was out! We always have a game night on Halloween, so this seems like the perfect fit for us! Huge fan of L99! Great game! This game looks like fun! Thanks! I’ve never tried combining one game with another…sounds challenging and probably a lot of fun. I enjoy Fluxx, but my favorite combined game is probably Munchkin. I’ve got the full Star Munchkin line, and am slowly adding the original fantasy-based collection….